Presenters are asked to prepare their presentations to match the time allocated in the program as these will be strictly enforced by the conference chairs. Presentations should be structured to include an introduction, the main content and conclusions. Visual aids (e.g. maps, charts etc) can be used but you are advised to keep the information simple, use colour and contrast for emphasis and use a large enough font (minimum 15 point) to ensure legibility. Presentations should be sent in advance of the conference as a PDF or PowerPoint file by e-mail to claire.garland@iop.org; please include the date and time of your presentation and only send presentations which are complete. If you are unable to send your presentation prior to the conference, please bring it with you on a USB memory stick and load it onto the PC located in the lecture theatre no later than the start of the session in which you are speaking. Please save your file as your surname and initial in the appropriate folder on the desktop. Direct connection of personal laptops (with set-up in the break prior to the corresponding session) is the alternative. For those using a PC laptop, please make sure you have a VGA output. If presenting from a Macintosh, please bring a VGA cable. Posters will be on display for the duration of the conference with a dedicated poster session taking place on Monday 30 March. During this session, authors are asked to remain next to their posters to answer questions. Posters can be mounted from 12:00 on Monday 30 March and must be removed by 13:00 on Thursday 2 April. Any poster not removed by this time, will be recycled. 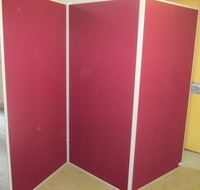 Poster boards measure 90cm x 180cm and orientated vertically (see picture below). Posters must fit within these dimensions. Posters must be prepared in advance of the conference as it will not be possible to print them on-site. Fixing material will be supplied to mount your poster. Posters are a visual presentation of your research and as such we recommend that you use schematic diagrams, graphs and tables, where possible, rather than just text. Please use an appropriate sized font so the information is legible at a distance of 1 metre. Your poster should include the title, author's name, and affiliations with the presenting author underlined. We recommend that this information is placed top centre of the page. For the poster, we recommend that you include an abstract, method section, results section and a conclusion or summary. You might also want to list key references or acknowledgements. If you decide to structure your paper differently, please ensure you format the poster with clear headings and keep text to a minimum.